The Economics Society encourages interaction and the exchange of ideas between Economics students in the College. Our primary aim is to support the academic wellbeing of Economics students at St John’s through information evenings and social events. We also encourage Economics graduates to return to the College to speak about their experiences and act as a resource for the future careers of current students. All Economists are automatically members of the society, and we currently have 36 members ranging from undergraduate to master study. This evening is designed to welcome all the new Economists to college and to introduce them to their peers, and existing students. The usual format for the evening is friendly drinks followed by a meal. Each year we invite guest speakers, sometimes alumni, to college to meet and speak to our current students. These talks are both academic and career orientated. Recent speakers include John Purkiss (co-author of How to be Headhunted and Brand You; now runs the board practice at Veni Partners), Adam Bailey (Vice President , Actuary at Morgan Stanley) and Jeffrey Campbell (Senior Economist and Research Advisor at the Federal Reserve Bank of Chicago). This is a brilliant opportunity for students in lower years to find out more about the options available to them in the coming years. They learn first-hand about the attractions and drawbacks of the choices, allowing the most informed decisions to be made. The evening takes place in the Wordsworth Room with port and cheese. 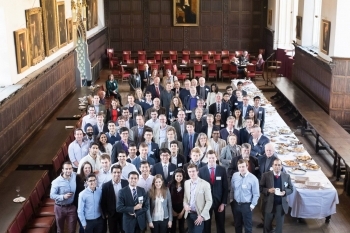 The Annual Black Tie Dinner takes place at the beginning of Easter terms, bringing together all the Economics undergraduates, postgraduates and fellows of the College. It is a chance to reflect on the year so far, and to wish all students good luck in their coming exams. To celebrate the end of the year, we host an annual garden party complete with croquet and Pimm’s. It is a popular event, attended by both students and Fellows.